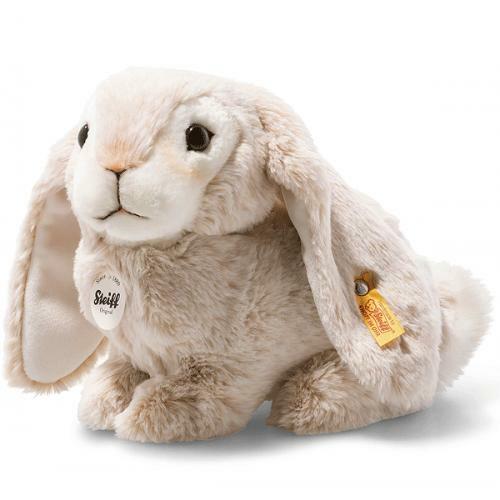 Steiff Lauscher Rabbit is made by hand, in the finest beige cuddly soft plush. When Lauscher rabbit sits, his height measures 24 cm and his super-long, floppy ears extend all the way down to his feet. His coat made of gorgeous and incredibly soft plush fabric in beige makes him a joy to look at. His face has a section of white that extends down to his chin. The inner surfaces of his ears and his characteristic fluffy tail are also white. His eyes, nose and mouth have brown paint. The pink nose and mount just make him that much cuter!